Casa Pacata is a lovely 3 bedroom, 2 bathroom property, situated on Quinta do Paraiso, which is 10 minutes walk from Carvoeiro town. The property has a private gated 8m by 5m pool which is great for young families. 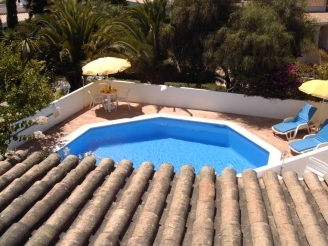 Clients also have the use of Quinta do Paraiso facilities with 3 communal swimming pools just a 5 minute walk away. Casa Pacata is set in beautiful established gardens. On entering the property straight ahead is a double bedroom with en suite bathroom and to the right is the lounge and dining area. The lounge area has air conditioning, SAT TV, table football for the kids, wood burner and eating area with dining room chairs and table. There are patio doors that open up onto a terrace area. The other 2 bedrooms each contain twin beds and one set of beds can be zipped together to form a large double bed if required. These 2 bedrooms share a bathroom. The kitchen and bathrooms have been recently refurbished. There is now WiFi available. Outside is a covered terrace area with teak table and chairs, also there is a small table and chairs overlooking the pool area. Through a gate and down a few steps is the swimming pool with terrace, sun loungers and shower. There are further terraces including a roof terrace which can be closed off and has lovely sea views. The property has a secluded garden with terrace and lawn area to the rear. Quinta do Paraiso is a family resort which is open through the season April/May to October/November offering guests restaurants, a mini mart, kids club, 3 swimming pools, tennis courts, PADI diving centre, crazy golf and various other recreational activities. 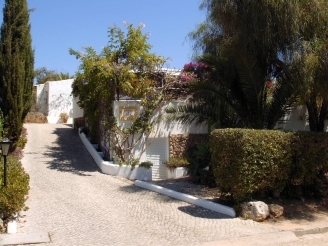 Monte Carvoeiro is 5 minutes walk away with restaurants, bars and a mini mart. 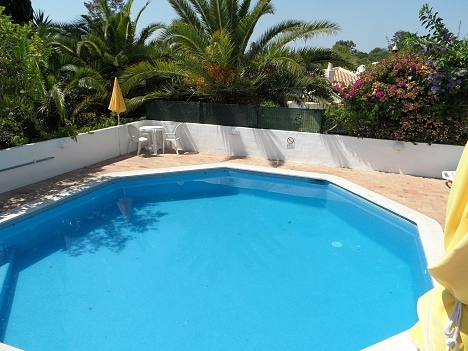 The property is 10 minutes walk from 2 beaches and also the same time from Carvoeiro town. Staying at Casa Pacata means you are in a good position with three Golf courses (Pinta/Gramacho and Vale do Milho) which are within a 5-15 minute drive away. Slide and Splash is 5 minutes drive and Zoomarine 20 minutes drive, just to mention a couple of the great attractions the Algarve has to offer. Maid twice a week including arrival day. ARRIVAL AND DEPARTURE... Arrival after 14H00 and departure before 10H00.